Students who are interested to take the University of the Philippines College Admission Test (UPCAT) this year can now apply online. First, you have to create a new account. Just go to this page to sign up. Fill out the online form with your First Name, Middle Name, Last Name, Name Suffix, Email Address, and desired Password. Check your email for the activation link. Your email address will also be your username. Read carefully and follow the instructions after creating a new account. 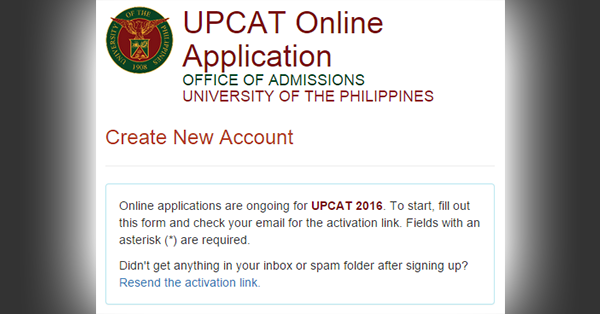 According to the university's Office of Admissions, "the UPCAT Online Application website features a brief background of the university, admissions options, eligibility and documentary requirements, modes of payment and procedures in applying for the UPCAT." "The website also offers tips in taking the examination itself and information on scholarships. Requirements and procedures for foreign applicants for admissions in the university are also available." What's advantageous with the online system is that applicants already issued with test permits will be provided with a link to an UPCAT Online Reviewer. "The official UPCAT reviewer will be made available to applicants on the first week of August," states a post on the site. "Applications for the UPCAT will be ongoing until 30 July 2015." The online application is part of UP's efforts to make the UPCAT application more accessible and convenient for the modern youth. It also helps reduce costs, prevent encoding errors and maximize technology. With the system, parents, students and schools no longer have to go to UP campuses to get application forms or send their forms and other requirements via mail. It likewise enables faster completion and processing of UPCAT applications, the university explained.